An RPC-038 instance prior to termination. Containment Protocols: All instances of RPC-038 are to be contained in a large chamber measuring a minimum of 20 m x 20 m x 15 m containing a large isolated piping system, transporting water, gas, sewage, and electricity throughout the system. Twice every day, 1 CSD personnel is to be left in this chamber to provide sustenance to all contained instances. In the event of the pipe system being damaged or any RPC-038 instance dying, a repair team armed with non-lethal weaponry is to be sent to correct the issue. Lethal force is allowed in emergencies. No more than 6 instances of RPC-038 are to be contained at any one time. Any wild instances discovered while this population is met are to be terminated. Should any reports of heavily mangled bodies with no identified killer or disappearances of urban explorers surface in areas known for RPC-038 activity, Authority containment personnel are to investigate the area around which this event occurred. Description: RPC-038 is the designation given to a long, silicone-based organism which resembles pipes, although it is significantly more flexible than the materials that would normal compose such constructions. RPC-038's defining feature is a large "mouth" stretching for half of the organism's mouth and containing a large number of canine teeth. It is usually found in abandoned human settlements, tend to reside in areas where it can easily blend in and acquire sustenance. RPC-038 has cyclical predatory patterns; the majority of this cycle it spends consuming resources found in piping or wiring such as water, gas, and electricity. 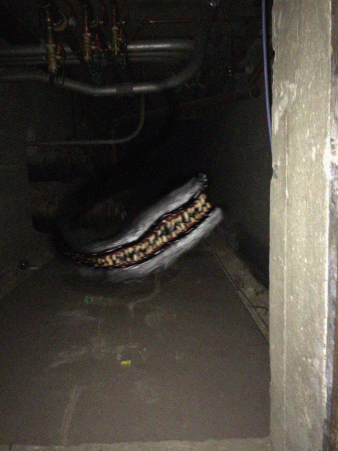 After approximately a week of this behavior, it will switch to the second part of the cycle, in which it will adjust itself to blend into nearby piping frames and wait for a human being to pass by. However, it may emerge to hunt should this stage last too long. All of these resources are required for RPC-038 to survive. Due to RPC-038's high metabolism, it requires a large amount of these resources, meaning it can lead to severe shortages of resources in regions it is feeding. RPC-038 instances are also highly territorial, attacking any living organism that enters their territory. It is unknown how or if RPC-038 instances reproduce. Neither sexual nor asexual reproduction have been observed, nor have any eggs been collected. It is also possible that RPC-038 may be artificially created organisms. This theory is supported by Authority extermination efforts seemingly stopping all RPC-038 related events, however, events appear to resume a few years after. It is also possible that RPC-038 lays eggs in a dormant state, which wait to hatch until they receive the correct stimuli to allow hatching. These possibilities are not mutually exclusive. A less likely possibility is that RPC-038 instances simply enter a hibernation stage, however, this has never been documented. Incident 038-A: On ██-██-19██, a broken pipe was discovered within RPC-038's containment chamber. When the repair team opened the chamber door, all 6 contained instances of RPC-038 ambushed the team, killing or incapacitating every member of the team before escaping the chamber and attacking the observation team. The site was immediately put on lockdown. Two RPC-038 instances began to feed on the site's power supply, creating unreliable power throughout the site until all instances were heavily sedated and re-contained. A second repair team found that the broken pipe was broken by an RPC-038 instance, leading some to believe this was a coordinated breach. No other data supports this level of thinking in RPC-038 instances, though more care should be taken in repairs. After this incident, a large amount of RPC-038 instances began appearing around and inside the site of the breach every few years. The cause of this is unknown.